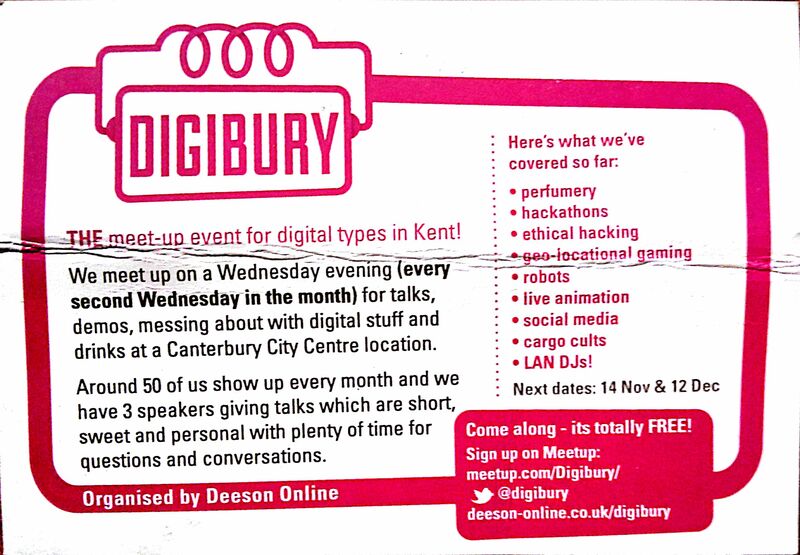 So the other day, for the first time, I went along to Digibury, a event for people interested in technology in the local area. At the monthly meetings you can normally expect to 3 different talks. At this months meeting we heard from Joe Webb, a PhD researcher in Cultural Studies. He is conducting an ethnograph about how “computing professionals” have learnt to use computers. He has started to see some very interesting generational differences in how people learnt to use the computers. Next up on the schedule was a talk from Deri Jones, from SciVisum. At SciVisum they specialise in load testing websites and web applications. From the data that they collect and analyse they can advise a business’s technical team so that they can adjust the companies website to be more efficient and capable of coping with the expected load. It also means that SciVisum can advise the less technical directors as to if there is a something that the companies technical team can do when their website has a fault. The final talk of the night was from Chris Atherton, a user experience architect. She was talking to us about the recognition rules that humans apply to the world around them, for example that a chair has 4 legs and a back, or that a wheel is circular and has spokes. She then asked that we apply these rules to showers and to microwaves, and we all came to realise that these products do not have any standard user interface. Eventually after some discussion we even decided that showers do not offer enough control for the temperature of the water, only cold or hot, whereas microwaves offer too much functionality above and beyond heating a dish for a set amount of time. All in all I really enjoyed the evening of talks, and am looking forward to next months set of talks on interfaces.